"Basanta Utsav" redirects here. For the film, see Basanta Utsav (film). "Holli" redirects here. For the ice hockey player, see Antti Hölli. Holi (pronunciation: /ˈhoʊliː/; Sanskrit: होली Holī) is a spring festival, also known as the festival of colours or the festival of love. It is an ancient Hindu religious festival which has become popular with non-Hindus in many parts of South Asia, as well as people of other communities outside Asia. Holi celebrations start on the night before Holi with a Holika bonfire where people gather, sing and dance. The next morning is a free-for-all carnival of colours, where participants play, chase and colour each other with dry powder and coloured water, with some carrying water guns and coloured water-filled balloons for their water fight. Anyone and everyone is fair game, friend or stranger, rich or poor, man or woman, children and elders. The frolic and fight with colours occurs in the open streets, open parks, outside temples and buildings. Groups carry drums and other musical instruments, go from place to place, sing and dance. People visit family, friends and foes to throw colour powders on each other, laugh and gossip, then share Holi delicacies, food and drinks. Some drinks are intoxicating. For example, Bhang, an intoxicating ingredient made from cannabis leaves, is mixed into drinks and sweets and consumed by many. In the evening, after sobering up, people dress up and visit friends and family. Holi is celebrated at the approach of the vernal equinox, on the Phalguna Purnima (Full Moon). The festival date varies every year, per the Hindu calendar, and typically comes in March, sometimes February in the Gregorian Calendar. The festival signifies the victory of good over evil, the arrival of spring, end of winter, and for many a festive day to meet others, play and laugh, forget and forgive, and repair broken relationships, and is also celebrated as a thanksgiving for a good harvest. There is a symbolic legend to explain why Holi is celebrated as a festival of colours. The word "Holi" originates from "Holika", the evil sister of the demon king Hiranyakashipu. The festival itself is believed to have origins from the Prahlada-Puri Temple of Multan in the Punjab region. The original temple of Prahladpuri is said to have been built by Prahlada, Hiranyakashipu's son. Holi is an important festival to Hindus. It is celebrated at the end of winter, on the last full moon day of the lunar month Phalgun (February/March), (Phalgun Purnima), which usually falls in March, sometimes in late February. Holi frolic and celebrations begin the morning after the Holika bonfire. There is no tradition of holding puja (prayer), and the day is for partying and pure enjoyment. Children and young people form groups armed with dry colours, coloured solution, the means to fill and spray others with coloured solution (pichkaris), water balloons filled with coloured water, and other creative means to colour their targets. In south India, some worship and make offerings to Kaamadeva, the love god of Indian mythology, on Holi. Holi (Hindi: होली, Nepali: होली, Punjabi: ਹੋਲੀ) is also known as Phakuwa or Phagwah (Assamese: ফাকুৱা), Festival of Colours, or Doḷajātra in Odisha, and as Dol Jatra (Assamese: দ’ল যাত্ৰা) or Basantotsav ("spring festival") in West Bengal and Assam. The customs and celebrations vary between regions of India. Outside India, Holi is observed by the minority Hindus in Bangladesh and Pakistan as well in countries with large Indian subcontinent diaspora populations such as Suriname, Guyana, Trinidad and Tobago, South Africa, Malaysia, the United Kingdom, the United States, Mauritius, and Fiji. The Holi rituals and customs outside South Asia also vary with local adaptations. In some places there is a custom in undivided Hindu families that the woman beats her brother-in-law with a sari rolled up into a rope in a mock rage, and try to drench him with colours, and in turn, the brother-in-law brings sweets (Indian desserts) to her in the evening. Outside Braj, in the Kanpur area, Holi lasts seven days with colour. On the last day, a grand fair called Ganga Mela or the Holi Mela is celebrated. This Mela (fair) was started by freedom fighters who fought British rule in the First Indian War of Independence in 1857 under the leadership of Nana Saheb. The Mela is held at various ghats along the banks of the River Ganga in Kanpur, to celebrate the Hindus and Muslims who together resisted the British forces in the city in 1857. On the eve of Ganga Mela, all Government offices, shops, Courts generally remain closed. The Ganga Mela marks the official end of "The Festival of Colours" or Holi in Kanpur. In Gorakhpur, the northeast district of Uttar Pradesh, this day starts with a special puja (Hinduism) in the morning of Holi day. This day is considered to be the most colourful day of the year, promoting brotherhood among the people. This is known as "Holi Milan" in which people visit every house and sing Holi songs and express their gratitude by applying coloured powder (Abeer). Holi is also considered as the beginning of the year as it occurs on the first day of the Hindu calendar year (Panchang). Kumaoni Holi in Uttarakhand includes a musical affair. It takes different forms such as the Baithki H oli, the Khari Holi and the Mahila Holi. In Baithki Holi and Khari Holi, people sing songs with a touch of melody, fun and spiritualism. These songs are essentially based on classical ragas. Baithki Holi (बैठकी होली), also known as Nirvan Ki Holi, begins from the premises of temples, where Holiyars (होल्यार) sing Holi songs and people gather to participate, along with playing classical music. The songs are sung in a particular sequence depending on the time of day; for instance, at noon the songs are based on Peelu, Bhimpalasi and Sarang ragas, while evening songs are based on the ragas such as Kalyan, Shyamkalyan and Yaman. The Khari Holi (खड़ी होली) is mostly celebrated in the rural areas of Kumaon. The songs of the Khari Holi are sung by the people, who, sporting traditional white churidar payajama and kurta, dance in groups to the tune of ethnic musical instruments such as the dhol and hurka. In Kumaon region, the Holika pyre is known as Cheer (चीर,) which is ceremonially made in a ceremony known as Cheer Bandhan (चीर बंधन) fifteen days before Dulhendi. The Cheer is a bonfire with a green Paiya tree branch in the middle. The Cheer of every village and neighborhood is rigorously guarded as rival mohallas try to playfully steal each other's cheer. Holi is known as Phaguwa in the local Bhojpuri dialect. In this region as well, the legend of Holika is prevalent. On the eve of Phalgun Poornima, people light bonfires. They put dried cow dung cakes, wood of the Araad or Redi tree and Holika tree, grains from the fresh harvest and unwanted wood leaves in the bonfire. At the time of Holika people assemble near the fire. The eldest member of the gathering or a purohit initiates the lighting. He then smears others with colour as a mark of greeting. Next day the festival is celebrated with colours and a lot of frolic. Traditionally, people also clean their houses to mark the festival. Holi Milan is also observed in Bihar, where family members and well wishers visit each other's family, apply colours (abeer) on each other's faces, and on feet, if elderly. Usually this takes place on the evening of Holi day after Holi with wet colours is played in the morning through afternoon. Due to large scale internal migration issues faced by the people, recently this tradition has slowly begun to transform. It is common to have Holi Milan on an entirely different day either before or after the actual day of Holi. Children and youths take extreme delight in the festival. Though the festival is usually celebrated with colours, in some places people also enjoy celebrating Holi with water solutions of mud or clay. Folk songs are sung at high pitch and people dance to the tune of dholak and the spirit of Holi. Intoxicating bhang, made from cannabis, milk and spices, is consumed with a variety of mouth-watering delicacies, such as pakoras and thandai, to enhance the mood of the festival. In West Bengal, Holi is known by the name of "Dol Jatra", "Dol Purnima" or the "Swing Festival". The festival is celebrated in a dignified manner by placing the icons of Krishna and Radha on a picturesquely decorated palanquin which is then taken round the main streets of the city or the village. On the Dol Purnima day in the early morning, students dress up in saffron-coloured or pure white clothes and wear garlands of fragrant flowers. They sing and dance to the accompaniment of musical instruments like ektara, dubri, veena, etc. The devotees take turns to swing them while women dance around the swing and sing devotional songs. During these activities, the men keep spraying coloured water and coloured powder, abir, at them. The people of Odisha celebrate "Dola" on the day of Holi where the icons of Jagannath replace the icons of Krishna and Radha. Dola Melana, processions of the deities are celebrated in villages and bhoga is offered to the deities. "Dola yatra" was prevalent even before 1560 much before Holi was started where the idols of Jagannatha, Balabhadra and Subhadra used to be take to the "Dolamandapa" (podium in Jagannath temple). People used to offer natural colors known as "abira" to the deities and apply on each other's feats. Holi is a part of Goan or Konkani spring festival known as Śigmo or शिगमो in Koṅkaṇī or Śiśirotsava and lasts for about a month. The colour festival or Holi is a part of longer, more extensive spring festival celebrations. Holi festivities (but not Śigmo festivities) include: Holika Puja and Dahan, Dhulvad or Dhuli vandan, Haldune or offering yellow and saffron colour or Gulal to the deity. In Maharashtra, Holi Purnima is also celebrated as Shimga, festivities that last 5 to 7 days. A week before the festival, youngsters go around the community, collecting firewood and money. On the day of Shimga, the firewood is a huge pile in neighborhoods. In the evening, the fire is lit. Every household brings a meal and dessert, in the honour of the fire god. Puran Poli is the main delicacy and children shout "Holi re Holi puranachi poli". Shimga celebrates the elimination of all evil. The colour celebrations here traditionally take place on the day of Rangapanchami, five days after Shimga. During this festival, people are supposed to forget and forgive any rivalries and start new healthy relations with all. Manipuris celebrate Holi for 6 days. Here, this holiday merges with the festival of Yaosang. Traditionally, the festival commences with the burning of a thatched hut of hay and twigs. Young children go from house to house to collect money, locally known as nakadeng (or nakatheng), as gifts on the first two days. The youths at night perform a group folk dance called Thabal chongba on the full moon night of Lamta (Phalgun) along with folk songs and rhythmic beats of the indigenous drum. However, this moonlight party now has modern bands and fluorescent lamps. In Krishna temples, devotees sing devotional songs, perform dances and celebrate with aber (gulal) wearing traditional white and yellow turbans. On the last day of the festival, large processions are taken out to the main Krishna temple near Imphal where several cultural activities are held. In recent decades, Yaoshang, a type of Indian sport, has become common in many places of the valley, where people of all ages come out to participate in a number of sports that are somewhat altered for the holiday. As in other parts of India, in rural Telangana region, children celebrate kamuda and collect money, rice, Mokkajonna and wood for weeks prior to Holi, and on Kamudha night all the wood is put together and set on fire. In Nepal, Holi celebrated in Hills is remarkably different from Madhesh, even the festival is celebrated on two different days. Holi is celebrated in the month of Falgun and is also called as the "Fagu/Phaguwa" and is celebrated on the full moon day (in hills) and the day after (in Madhesh) in the month of February. The word "Fagu/Phaguwa" (Nepali:फागु/फगुआ) represents the month of Falgun and the day is called the "Fagu Purnimaa" (Devanagari:फागु पुर्णीमा) which means (full moon day in the Falgun). In Nepal, Holi is as important as Dashain, Tihar (Dipawali). Since more than 80% of people in Nepal are Hindus, Holi, along with many other Hindu festivals, is celebrated in Nepal as a national festival. People walk down their neighbourhoods to celebrate Holi by exchanging colours and spraying coloured water on one another. A popular activity is the throwing of water balloons at one another, sometimes called lola (meaning water balloon). Also a lot of people mix bhang in their drinks and food, as is also done during Shivaratri. It is believed that the combination of different colours at this festival take all the sorrow away and make life itself more colourful. Holi is celebrated by Hindus in Pakistan, in cities such as Karachi, Hazara, Rawalpindi, Hyderabad, Multan and Lahore. Locals in Multan associate Holi and Prahlada with the Prahlada-Puri Temple. Indigo, Indian berries, species of grapes, blue hibiscus and jacaranda flowers are traditional sources of blue colour for Holi. A 2007 study found that Malachite green, a synthetic bluish-green dye used in some colours during Holi festival, as responsible for severe eye irritation in Delhi, if eyes were not washed upon exposure. Though the study found that the pigment did not penetrate through the cornea, malachite green is of concern and needs further study. 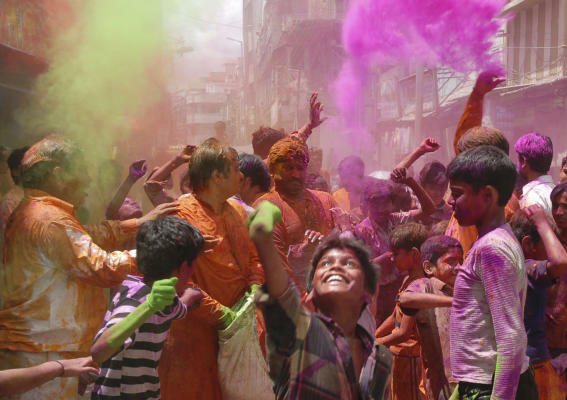 Another 2009 study reports that some colours produced and sold in India contain metal-based industrial dyes, causing an increase in cutaneous problems to some people in the days following Holi. These colours are produced in India, particularly by small informal businesses, without any quality checks and are sold freely in the market. The colours are sold without labeling, and the consumer lacks information about the source of the colours, their contents, and possible toxic effects. In recent years, several nongovernmental organisations have started campaigning for safe practices related to the use of colours. Some are producing and marketing ranges of safer colours derived from natural sources such as vegetables and flowers. The method of powder application at the concert created "an extremely dense dust cloud over the stage and its immediate vicinity", people near the stage were standing ankle deep in colored corn starch powder and the powder was suspended into the air using air blowers as well as compressed gas canisters. Initial investigations into the explosion showed the ignition of the suspended corn starch powder was likely caused by a cigarette or spark. An Asia One report states that such an explosion can occur, under certain conditions, not just with corn starch but with powder form of any agricultural product such as "powdered milk, soya flour, cornflour, rice dust, spice powders, sugar, tapioca, cocoa powder, coconut shell dust, coffee dust, garlic powder, grass dust, malted hops, lemon peel dust, oat flour, peanut skins, tea and tobacco", and that "the crucial element is not the composition of the powder itself, but whether it's deployed under high pressure with a flame nearby." Holi festival is increasingly celebrated outside India, in many parts of the world. Holi is celebrated as a social event in parts of the United States. For example, at Sri Sri Radha Krishna Temple in Spanish Fork, Utah and Festival of Colors: Holi NYC in Brooklyn, New York, Holi is celebrated as the Festival of Color, where thousands of people gather from all over the United States, play and mingle. A number of Holi-inspired social events have also surfaced, particularly in Europe and the United States, often organized by companies as for-profit or charity events with paid admission, and with varying scheduling that does not coincide with the actual Holi festival. These have included Holi-inspired music festivals such as the Festival Of Colours Tour and Holi One (which feature timed throws of Holi powder), and 5K run franchises such as The Color Run and Color Me Rad, in which participants are doused with the powder at per-kilometre checkpoints. ↑ 20.0 20.1 20.2 Holi – the festival of colours Indian Express. This page was last modified on 9 January 2016, at 18:17.